During the fall of 2011, László Veres (HA7XK), brought to my attention the existence of a Feld-Hell model that was built in Hungary. 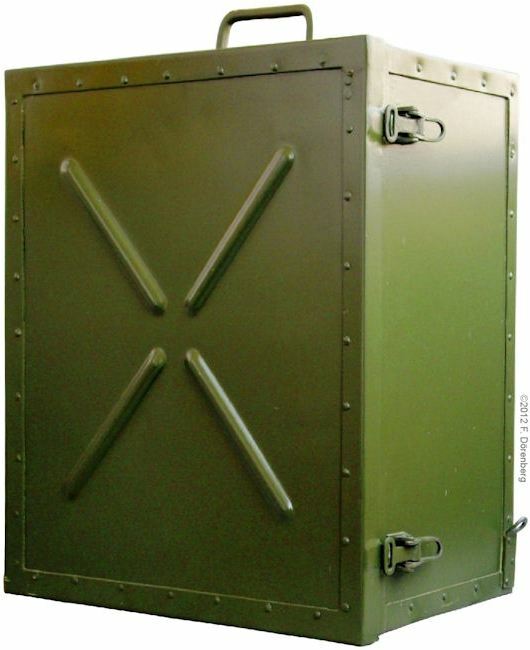 Note that this is not simply a standard German Hell Feldfernschreiber that was built during World War 2 by a Siemens-Halske subsidiary in occupied Hungary. This model actually dates to the early 1950s! However, the design, including the electronic circuitry and construction, very closely follows that of the "standard Feld-Hell". 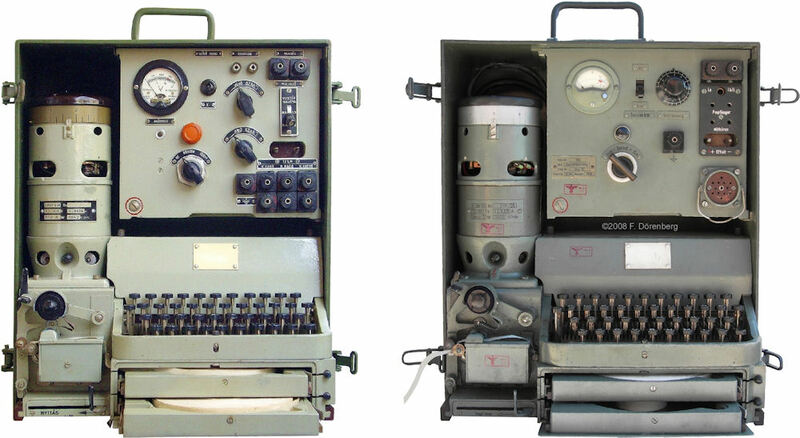 The designator of this model is HTG-1, where "HTG" = Hellschreiber Távírógép = Hellschreiber ticker-tape machine. It was manufactured by the Telefongyár company ("Telephone Factory") in Budapest, between 1948 and 1954 (ref. 7). It is unclear if it was designed there as well. The history of Telefongyár Rt. (TRT, Terta) goes back to the end of 1876, when János Neuhold officially registered his railway and Morse telegraphy equipment repair activities in Budapest/Hungary. During the following ten years, his repair business gradually expanded with production of telegraph equipment, and a variety of small military equipment items, railway safety/signalling equipment. At that time, the company name was Vasúti szerelvény és elektrotechnikai gépgyár ("Railway assembly and electrical engineering factory"). Around 1890, Neuhold receives the first orders from the national postal company for telephones. After taking his company public 1891, the name is changed to Neuhold Vasúti Szerelvények és Elektrotechnikai Gépgyár Rt. ("Neuhold Railway Fittings and Electrical Engineering Factory"). After a steady decline in business and unsuccessful refinancing, Neuhold abandons the company mid-1894, and starts a new company later that year: Neuhold és Társa Vasútfelszerelési és Villamossági Gépgyár ("Neuhold and Co. Railway and Electrical Equipment Factory"). In 1900, they are acquired by the German company Telephon-Fabrik AG vormals J. Berliner (TEFAG, "Telephone Factory Ltd. formerly J. Berliner", founded by József Berliner, Jakob Hanover, and Hahn Miksa). Starting in the early 1900s, the Budapest company received large orders for telephone and signalling devices for the Royal Hungarian State Railway. By then, the company was commonly referred to as Telefongyár ("Telephone Factory"). János Neuhold died in 1904, while on a business trip to the Telephon-Fabrik AG head office in Hannover/Germany. His son Kornél Neuhold took over the management of the company. In 1911, Telefongyár becomes an independent Hungarian company. Its activities cover the manufacture of telecommunication and telegraphic equipment, mechanical engineering, metal industry, electrical engineering and related products. During WW1, the company produces military items such as guns, ignition devices, snowshoes, and boots, as well as light bulbs and small radios. After the war, Hungary is occupied by the Soviet Union, and the company is confiscated. Between WW1 and WW2, the company continues with railway signalling devices and telephones (incl. 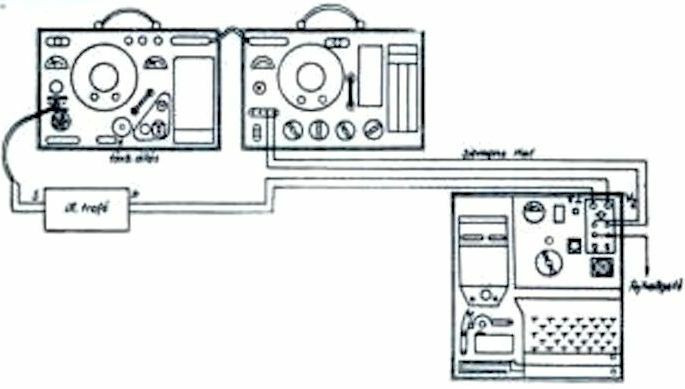 a handset under license from Telefunken), and expands with batteries, radios, headphones, rail cart air brakes, fuel meters, audio recording equipment, and odd items such as potato-, tomato- and fruit-pulp thickening machines, zippers, spark plugs, refrigerators, and small boat engines. In 1928, the Standard Elektrizitätsgesellschaft (SEG, German part of the I.T.T. conglomerate) acquired a majority share in the company, but sold its share to the British Standard Co. in 1933. In 1939, the company is once again converted to produce war material, while telephone production continues. Early 1945, the company was placed under Soviet military command for about 6 months. In 1949, it was nationalized and renamed to Telefongyár Nemzeti Vállalat ("National Telephone Factory Company"), shortly thereafter simplified back to Telefongyár. Products included telephone and telegraphy equipment, telephone exchanges, movie projectors, audio amplifiers, radio equipment, manufacturing machining, audio tape recorders, TVs, and pipeline inspection equipment. In 1990, Telefongyár entered into a joint venture with Siemens-Hungary. It was privatized in 1991 and became a wholly-owned subsidiary of Siemens. Ref. 8, 9. Note that Siemens & Halske already established its presence Budapest/Hungary in 1887, with a tramway company. Siemens has been present in Hugary ever since, ref. 10. Two of these machines are in the collection of the Museum of War History (Hadtörténeti Intézet és Múzeum) in Budapest/Hungary (one is exhibited). About 15 thousand HTG-1 machines were built, but no more than about 20 are estimated to have survived (ref. 6). The motor-generator turns at 3840 rpm (vs. 3600 in S-H Feld-Hell). There is a volume control for the modulated output pulses, not only for the input signal. There is no 12-pin round connector, but 3 pairs of binding posts (wire or banana plug) - more practical! 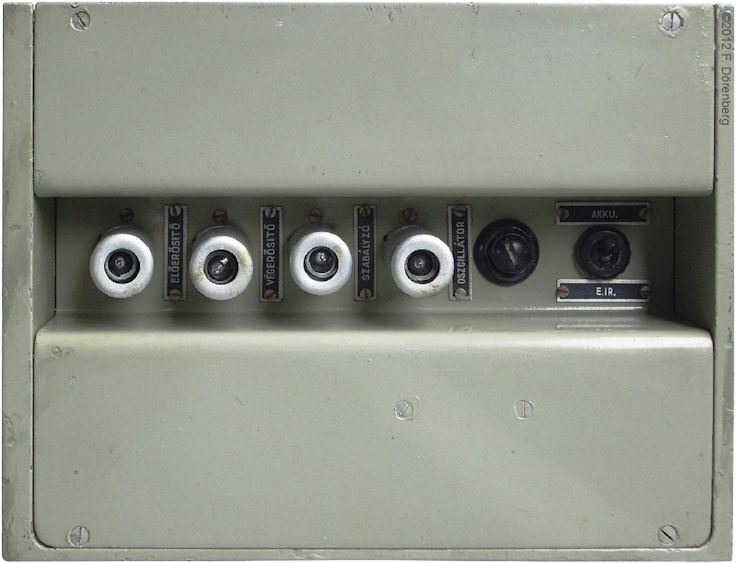 There is a 3-position toggle switch for the interface configuration / operation mode. The electronics are based on four tubes of type 6AU6 and 6AU8 - instead of four RV12P4000. 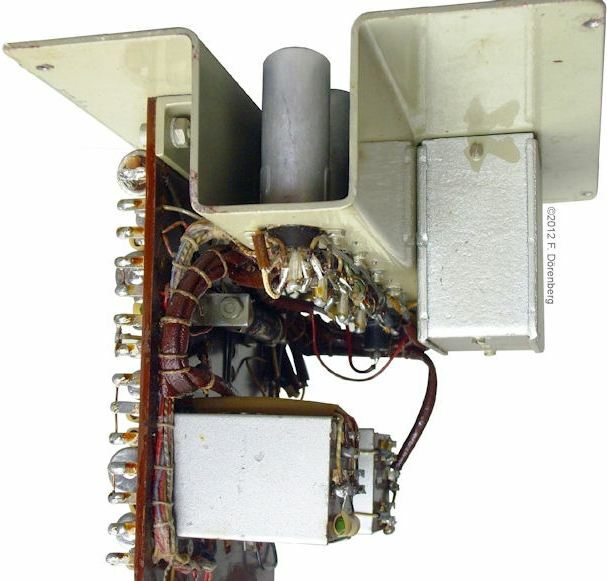 The monitoring/headset output ("Mithören" in the Siemens-Halske Feld-Hell) is not transformer-isolated; instead, it is connected to the anode of the pre-amplifier tube, via a blocking capacitor. 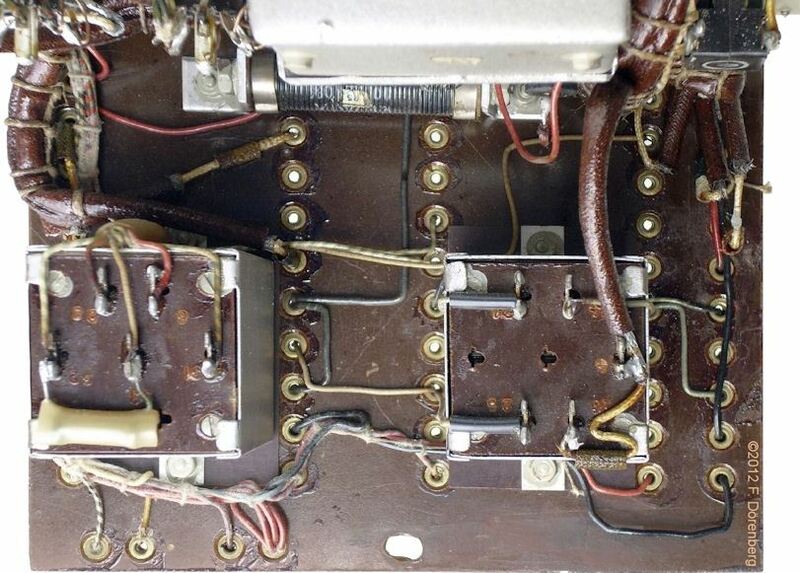 There is no separate phone jack for a field telephone. 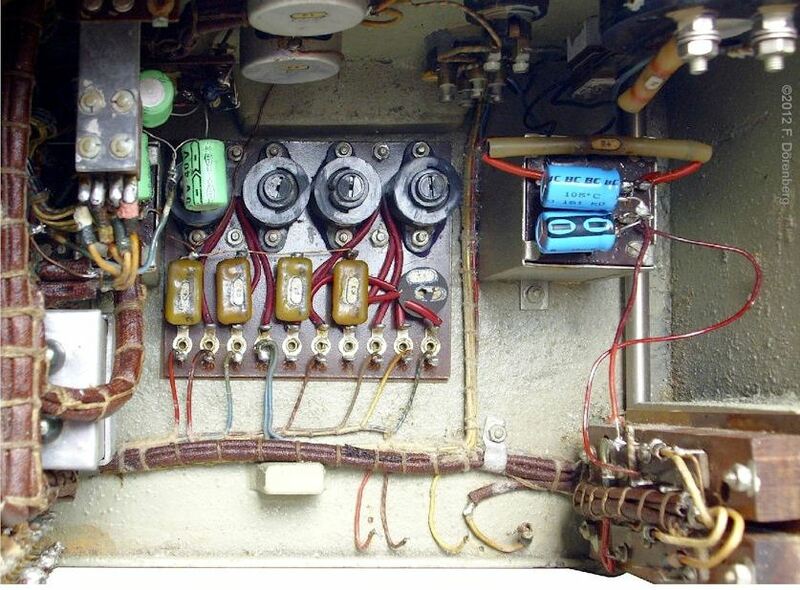 The push-button to select the range of the voltmeter (battery vs. anode voltage) is a separate switch in the front panel. In the S-H Feld-Hell, the switch is integrated in the bezel of the instrument. There is no equipment label with serial number, year of manufacture, etc. Interestingly, the "battery / power-supply" toggle switch has been retained. Hungarian is a difficult language - for foreigners. Basically, signal names and switch positions that begin with a "K" (for "Kemény") have to do with transmitter "keying", those beginning with "M" (Modulált), with modulated tone pulses. The two diagrams below show the close similarity between the schematics of the standard Feld-Hell and the HTG-1. 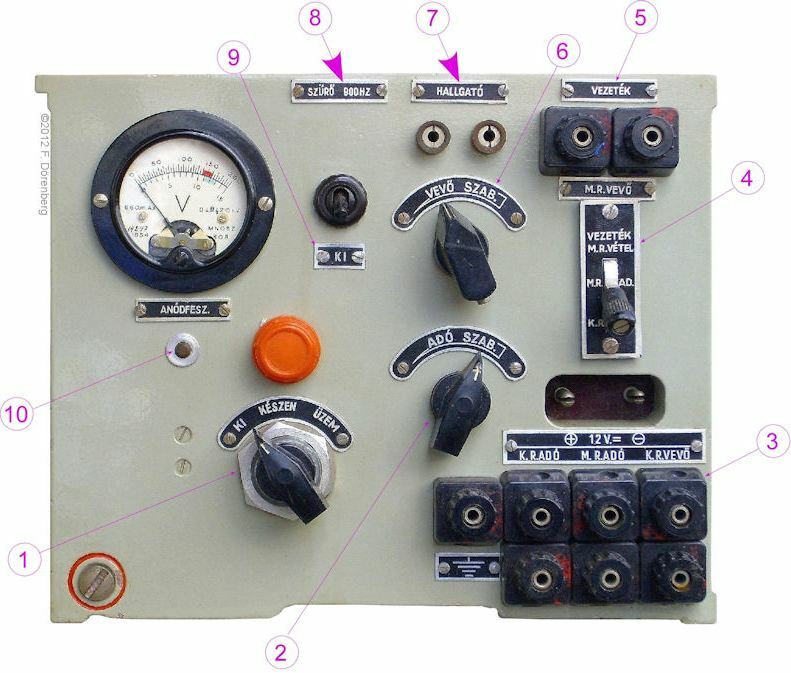 A detailed schematic of the HTG-1 is provided in ref. 1A. 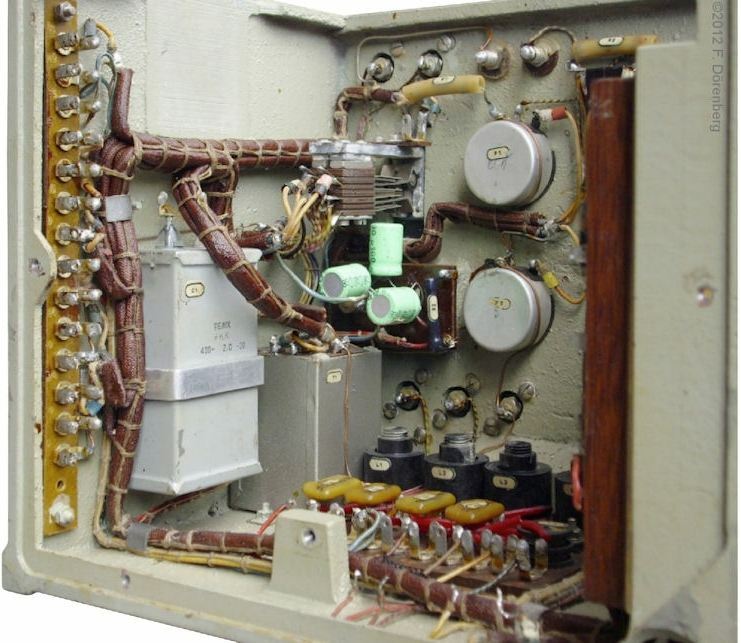 The 6AU6 tube is a 7-pin miniature pentode (RCA, 1953). Ref. 2. It was typically used in AF and RF amplifiers, e.g. in television sets. Equivalents are the CV2524 and EF94, and it is similar to the EF85. Tungsram in Hungary also manufactured this tube (under license). The tube has a large transconductance (4000-5000 μmho, depending on anode voltage), but a relatively low amplification factor of only 36. Transconductance is a measure of the change in anode current to a change in grid voltage, with anode voltage held constant; units: mho (old; "ohm" spelled backward), siemens. (Static) amplification is gain, expressed as the ratio of the change in anode voltage for a change in grid voltage; units: mu (μ). Fig. 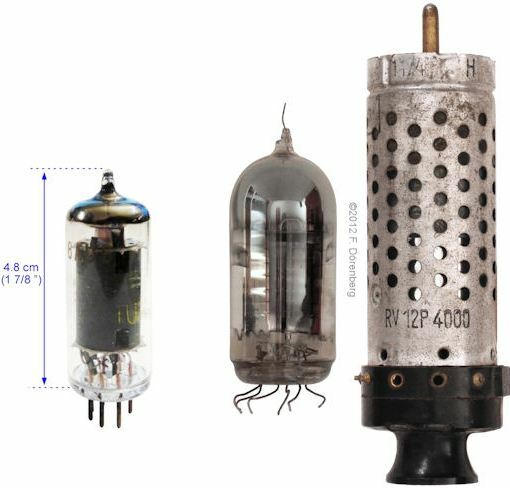 11: the "6AU6" compared to the "RV12P4000"
The 6AU8 tube is a 9-pin miniature triode-pentode (RCA, 1947). The pentode part is used for the tone oscillator. The triode part is not used. Ref. 1A. The RV12P4000 tube of the standard Feld-hell has a large static gain (4000 max) as well as a large transconductance (2300 μmho). 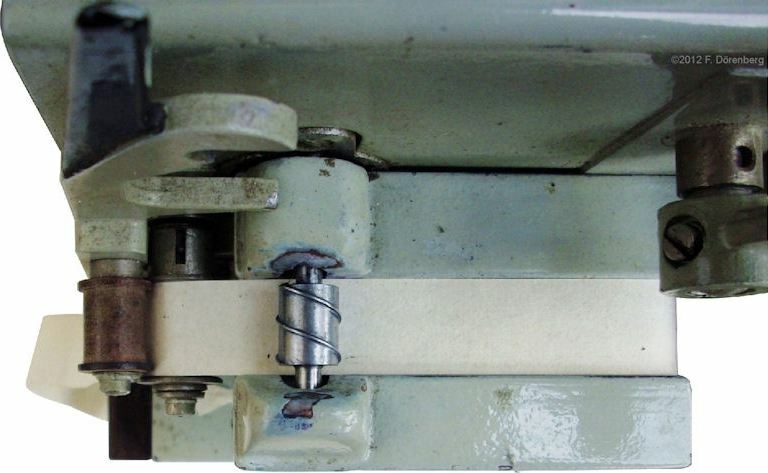 The Royal Hungarian Army (RHA) may also have used Tungsram tubes of type HP1220 in their German Feld-Hells, as a subsitute for the RV12P40000. 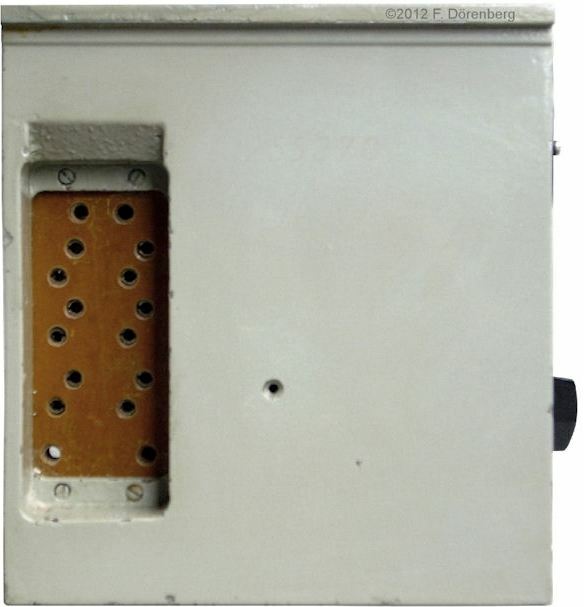 The HP1220 is a high-frequency pentode with 12 volt heater voltage and 20x10=200 mA heater current. 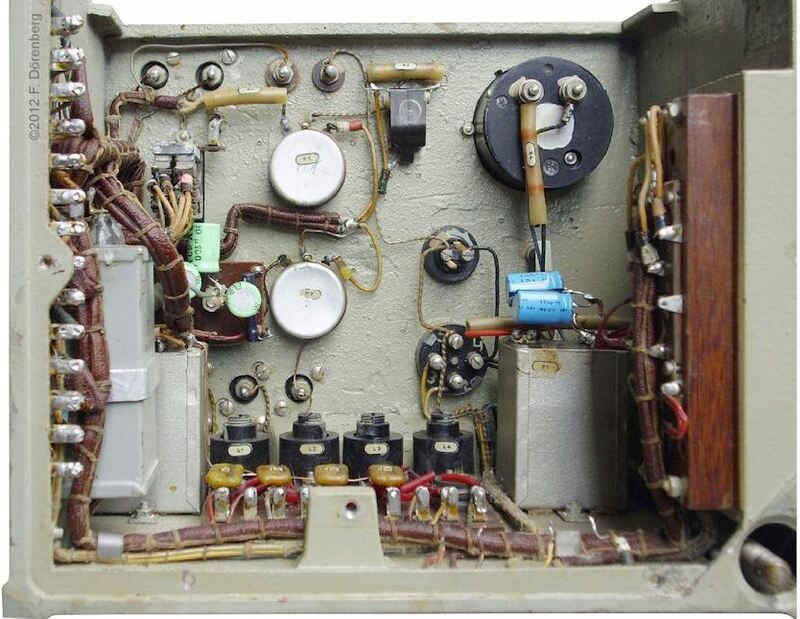 Other components (capacitors, resistors, potmeters, possibly also the transformers) in the HTG-1 Hellschreiber were made by the company REMIX Radiotechnikai Vállalat [Radio Technology Company] in Budapest/Hungary. The company was founded in 1932 and changed its name to simply "REMIX" in 1937. As in the Siemens-Halske Feld-Hell, all components have a small sticker with the component number from the schematic. However, here, the signal numbers are not screen-printed onto the circuit card, but stamped into the card. Resistors and diodes have a plastic sleeve. 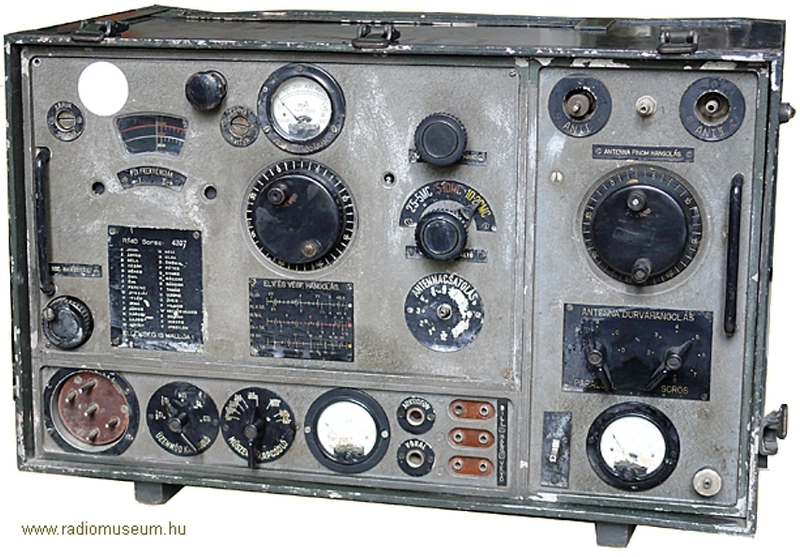 The R/7 transmitter ("adókészülék", "adó") and the R/7 receiver ("vevőkészülék", "vevő"). Ref. 11, 12. 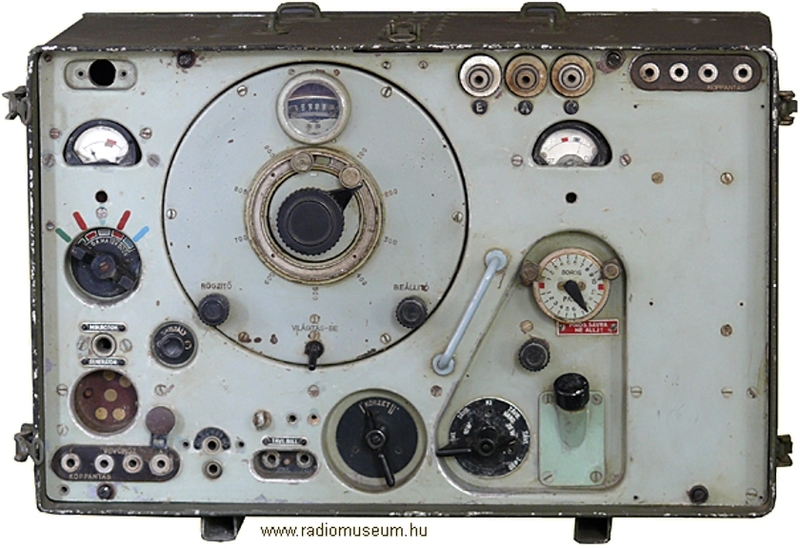 These radios date back to around 1939, and were manufactured by Telefongyár Rt. (Terta), like the HTG-1. They covered the frequency range of 3750-8600 kHz, and operated on 4.5 and 132 volt (from battery or an R/7a "lábhajtású generátora" pedal-powered generator). 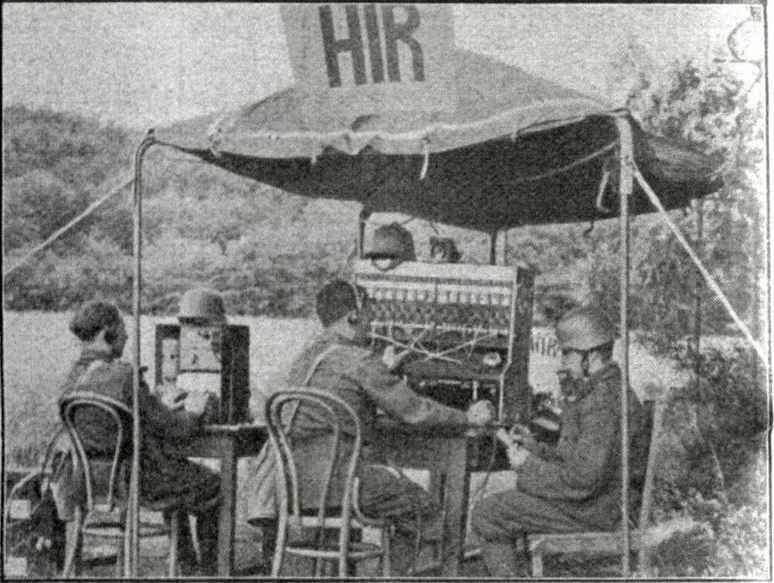 The Hungarian Air Force used the HTG-1 with the R-40 and R-50 transmitters, for communication between bases. 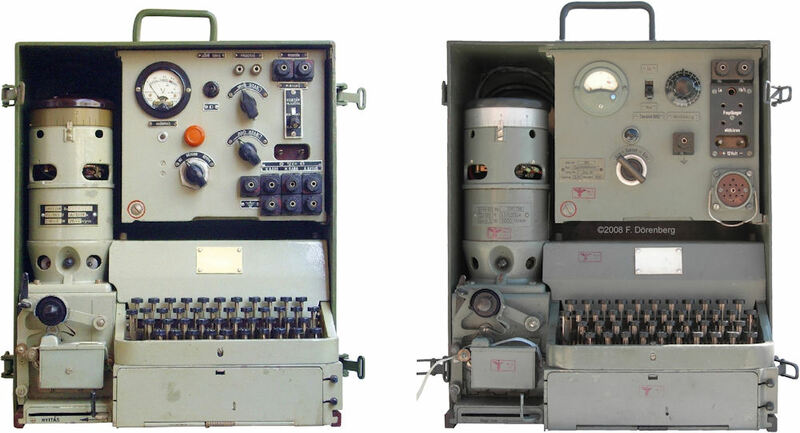 Both were CW/AM transmitters and had a "hookup for Hellschreiber". Ref. 13. 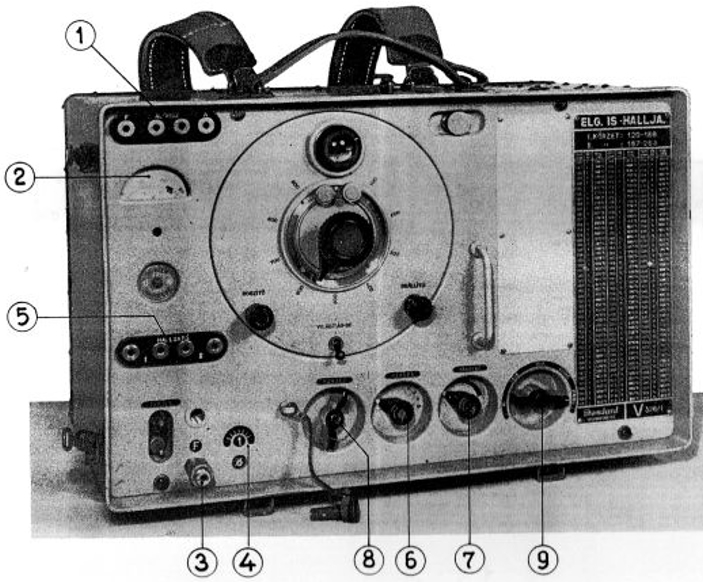 The R-40 had an output power of 100 W (CW telegraphy or Hellschreiber) or 25 W (AM phone). It covered the frequency range of 2.5-20 MHz with three bands. The R-40 was built by Telefongyár - Magyar Adócsőgyár [Hungarian Taxi Factory] during 1952-1955. 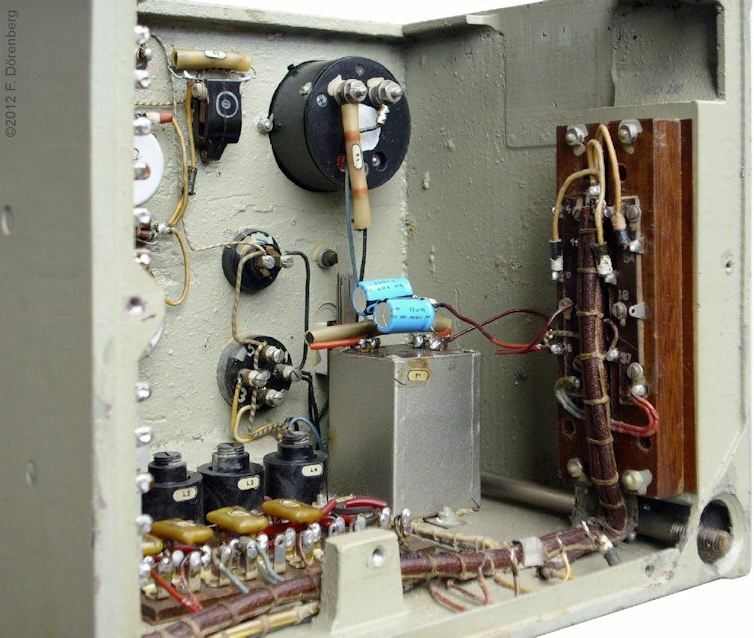 This transmitter was also used in radio trucks. 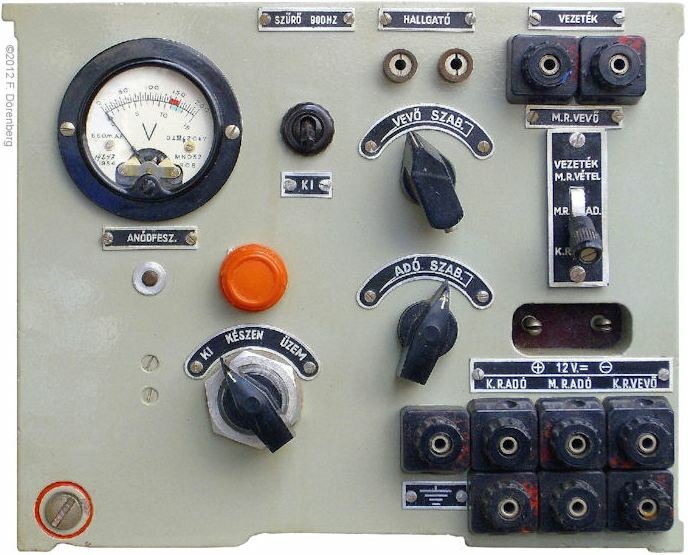 The R-50 CW/AM transmitter had an output power of 1.5 kW (CW/Hell) or 250 W (AM tone/phone). It covered the frequency range of 2.75-15 MHz. The R-50 was built by Magyar Philips Művek Rt. (Hungarian Philips Works Co.) in Budapest during the early 1950s. This company was established by the 1939 merger of (Vatea Radio Technology) and Philips Rádió és a Villamossági Rt. (Philips Radio and Electricity Co.). It was nationalized in 1949, and renamed Magyar Adócsőgyár (Hungarian Taxi Factory). In 1966, it was absorbed into the Egyesült Izzólámpa és Villamossági Rt. (United Electric Incandescent Light Factory Co.), which became part of General Electric (GE) in 1989. Ref. 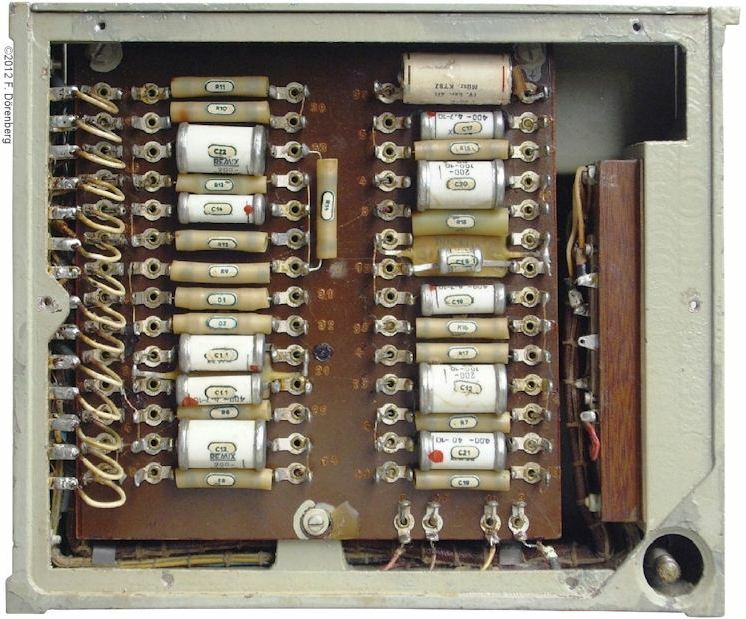 2: "6AU6 - 6AU6A", Datasheet, Tung-Sol Electric Inc., Electron Tube Division, August 1962, 4 pp. Ref. 4: "39 M. tábori távírógép műszaki leírása és kezelési utasítása (1942)" [Technical description and operating manual for field tape-teleprinter (1942)], Magyar Királyi Honvéd Híradó Kiképzőtábor Parancsnokság [Signal Corps School of the Royal Hungarian Army], 30 pp., 1942. The cover page of this document is here. Ref. 6: personal email exchange with Lázin Miklós András (HA5CBM), 5 December 2017. Ref. 7: "A magyar középgépipar - Hadiipar és haditechnikai termelés Magyarországon 1945 és 1980 közöt" [The Hungarian Central Machine Industry - Military and Military Technology in Hungary between 1945 and 1980], Pál Germuska, Argumentum Publishing & Printing, 2015, 613 pp. Ref. 9: "History of the Telephone Factory from 1876 to 1991", Google-translation of the "factory history" pages of telefongyar.hu; accessed 4-Oct-2018. Ref. 11: 1952 Hungarian handbook; title, author(s), publisher unknown; referenced on "Egy különleges masina, a HTG-1 Hellschreiber adó-vevő" [pdf], ["A Special Machine, the HTG-1 Hellschreiber Transceiver", pdf], article by Miklós András Lázin (HA5CBM) on the Budapest Amateur Radio Club website, 30 January 2017. Accessed 25 March 2019. Ref. 13: "Hungarian Air Force Communications Equipment", CIA Information Report, 3 October 1957, 3 pp. Document nr. CIA-RDP80T00246A037700360001-4. (sanitized / declassified / released 12 July 2010). Accessed 25 March 2019. Ref. 14: "A Siemens-Hell rendszerű tábori írókészülék kezelési utasítása" [Siemens-Hell-based field printer equipment operating instructions], Magyar Siemens-Schuckert Művek Villamossági Rt. [Siemens-Schuckert Hungarian Electricity Works Inc.], Budapest, 72 pp.